Fake Plug in black acrylic with 1.2mm shaft, 8mm disc end and rubber O ring. 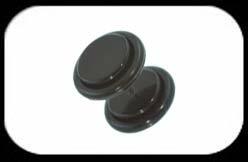 Fake plugs are designed to fit a normal ear piercing but to give large flesh plug appearance. I recived this item very quickly and am very pleased with it. Yeah, fast and quick delivery, pain that we had to sign for them and that but its all cool! They look awesome on, only problem i found is that the little black ring that goes in the grooves on both sides tends to fall off. they look great and everyone thought they're real plugs :) love them. Just received my two fake plugs, shipping to Latvia took 11 days like last time, very satisfied THANK YOU!